Laurel, Maryland (CNN) - At the end of a row of neatly arranged banquet chairs, Sandra Ashford sat reverently, still in awe of what she says is her mother’s miraculous recovery from cervical spinal stenosis. “If it wasn’t my mother,” Ashford said, “I wouldn’t believe it." She explained how after a “laying of hands,” her 74-year-old mother, Delsie McDougall, no longer experiences the symptoms from what was becoming a debilitating condition. When she arrived in early December from her native Jamaica in search of treatment options, McDougall said, she couldn’t “walk straight.” When her neurologist prescribed surgery, she sought an alternative, one more in keeping with her faith. Editors note: Every week CNN International's African Voices highlights Africa's most engaging personalities, exploring the lives and passions of people who rarely open themselves up to the camera. This week we profile Enoch Adeboye, one of the world's most influential spiritual leaders. Havana (CNN) – For decades, Cuba’s evangelicals met behind closed doors, holding services in living rooms and converted garages. But as the country confronts hard times, followers have come out of the shadows, turning to religion to meet both economic and spiritual needs. 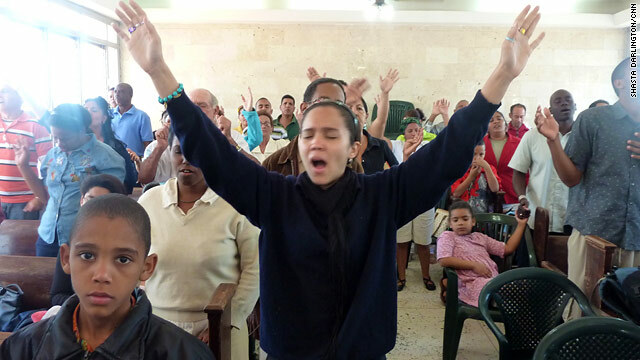 On a recent Sunday morning, worshipers packed a Pentecostal church set up on the second floor of an apartment building in a working class suburb of Havana.